Lithogrpah printed in colors, printed by G. Ricordi & C., Milan, Italy 1902. Condition: Very Fine (A-) , backed on linen. 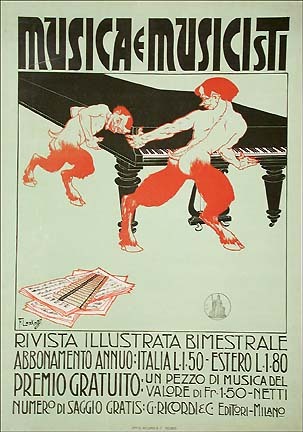 Sheet size: 19.5 H. X 13.5 W.
In this playful poster for the magazine "Music and the Musician", the Polish artist Franz Laskoff depicts a pair of Pan's wrestling with a grand piano. Judging from the pipes and sheet music on the stage floor, at least one Pan would rather entertain with his simple pipes then to sit down at the more refined piano. This is a rare example of Laskoff's early work with Ricordi, the prestigious Italian music publisher. During the early 20th century, Ricordi also became known for their posters, employing the great names in early Italian poster art.